that was caught off Durban in May. 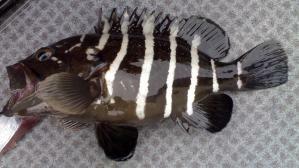 The rare eightbar rockcod, Epinepheus octofasciatus, was called Epinephelus septemfasciatus in Smiths’ Sea Fishes but this species (E. septemfasciatus) is only known from Korea, Japan and China. The eightbar rockcod has seven or eight dark bars on its body and attains at least 80 cm. Sean Fennessy of ORI sent in a photograph of an eightbar rockcod caught off Durban in 60 fathoms. This is the most southerly specimen known from South Africa. The eightbar rockcod is an Indo-West Pacific species but records are patchy probably due to its preference for fairly deep water. It is usually caught with hook-and-line and on longlines. A nightgoby Priolepis nocturna photographed by Greg de Valle at Sodwana Bay. The sharp eyes of Greg de Valle of Sodwana Scuba noticed a nightgoby Priolepis nocturna on white soft coral at Sodwana Bay. He was able to document his sighting with a photograph. This Indo-Pacific species was known from the WIO islands of the Maldives, Seychelles, Mauritius and the Comoros. A couple of years ago a Fishwatch member, Georgina Jones, spotted a nightgoby when diving off Ponta do Ouro, southern Mozambique. Unfortunately she was unable to document her sighting with a photograph but her vivid description of this distinctive goby enabled us to be fairly confident of its identity. Greg’s photograph is the first documented record we know of this species in South Africa. Nightgobies have a whitish body with five black bars, two of which continue up into the dorsalfins and form a large black spot; there is a third large black spot on the dorsal edge of the tail fin base. Nightgobies are found on rocky drop offs to 35 m and in lagoon habitats to about 10 m.
Neville Ayliffe of Reefteach, Sodwana Bay, saw a whitespotted surgeon, Acanthurus guttatus, at Breaking Waters. It was a day of excellent visibility (about 50 m) and Neville was close to the fish but unfortunately didn’t have his camera with him. This is an unmistakable surgeonfish and we hope that someone will photograph it (and send us a scan) to document this record. This species is only known from the islands of Chagos, Maldives, Mauritius, Rodrigues and Seychelles in the WIO. 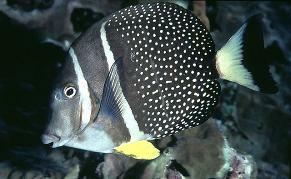 Whitespotted surgeonfish live in the surge zone of exposed reefs or rocky shores. The white spots are thought to help camouflage the fish amongst the bubbles generated in these turbulent areas. They feed mainly on filamentous algae.